Earth (on the left) and the moon (on the right) were seen by NASA's Juno spacecraft on Aug. 26, 2011, when the spacecraft was about 6 million miles (9.66 million kilometers) away. The photo was taken by the spacecraft's onboard camera, JunoCam.  A NASA probe headed to Jupiter has snapped a striking photo of Earth and the moon, showing our home planet as it appears from 6 million miles away. The Juno spacecraft took the new photo on Aug. 26 as part of a test of its camera imaging system called JunoCam. The result: a parting shot of the Earth-moon system as the probe sails on its five-year trip to Jupiter. NASA released Juno's family portrait of Earth and the moon on Monday (Aug. 30). It shows the Earth as a bright white disk on a vast field of black space. The moon appears as a tiny speck of light to the Earth's right. Juno beamed the photo home about 25 days after its Aug. 5 launch from Florida. The spacecraft covered the distance between the Earth and moon, a span of about 250,000 miles (402,000 km), in less than a single day, according to a NASA description. NASA's $1.1 billion Juno probe headed to Jupiter is the first solar-powered mission ever aimed at the gas giant. The spacecraft will arrive in orbit around Jupiter in July 2016 and is expected to uncover new clues into the origins, atmosphere and core of the largest planet in our solar system, mission scientists have said. By coincidence, Juno snapped its home planet photo nearly 34 years after another iconic view of Earth and the moon from a different spacecraft — the Voyager 2 probe. This picture of a crescent-shaped Earth and moon -- the first of its kind ever taken by a spacecraft -- was recorded Sept. 18, 1977, by NASA's Voyager 2 when it was 7.25 million miles (11.66 million kilometers) from Earth. Because the Earth is many times brighter than the moon, the moon was artificially brightened so that both bodies would show clearly in the prints. Voyager 2 took its stunning view of Earth and the moon, which actually reveals Earth's blue oceans and clouds, along with a crescent moon overhead, on Sept. 18, 1977. That photo was taken from a distance of about 7.3 million miles (11.6 million km) .